Leaflets three, let it be! Berries white? Take flight! Truer words were never spoken if you, like me, are among the 85% of the population who are allergic to poison ivy. If you are not sensitive to this plant, consider yourself lucky! And if you are unsure, learn to identify it, and try to avoid it. The entire plant – leaves, stems, flowers, fruits, and roots— is poisonous thanks to a colorless, difficult-to-detect oil called urushiol. The oil can cause a very itchy rash that at its worse can become blistery and last two weeks or more. 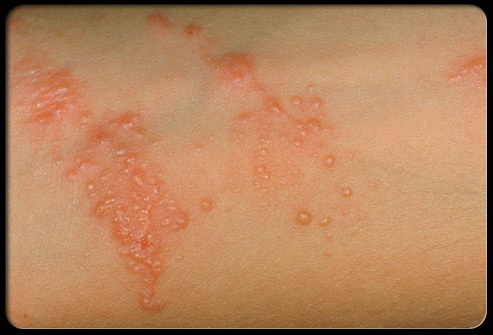 The rash is not contagious (nor is the fluid inside a blister) and scratching does not spread it, but some areas may show up later than others. And speaking from experience, the rash is quite irritating and unattractive. 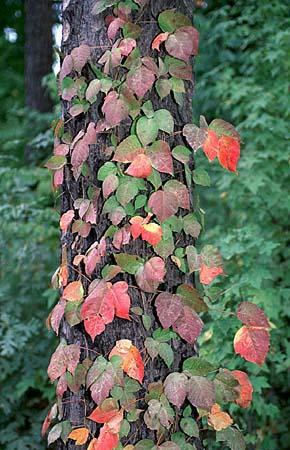 Eastern poison ivy (Toxicodendron radicans) is a woody perennial vine, or small shrub that belongs to the Cashew (Anacardiaceae) family. It reproduces by underground rhizomes and seed. I frequently encounter it as leafy shoots about ankle high. It has compound leaves that occur in threes. The leaflets are elliptic to egg-shaped. The middle leaflet has a long stem. Twin side leaflets have short stems and sometimes are shaped like a mitten. 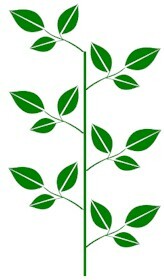 The leaves are alternately arranged along the main stem as illustrated below. In summer the leaves are green. Flowers are small, yellowish green, in clusters of 2 to 6 in lower leaf axils. In fall, the leaves change to autumn colors and tiny berries begin to form. When the leaves drop, the berries get plump and turn white. 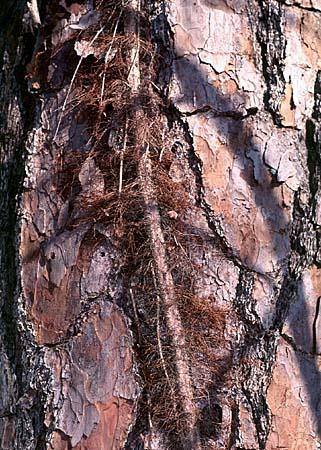 In winter, the plant is most noticeable as a thick brown vine with shaggy rootlets creeping up a tree. 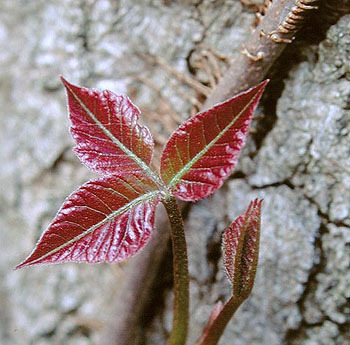 In spring, new leaves appear, shiny and red with green venation. Poison ivy prefers moist, deciduous forests, but it is resilient and can grow anywhere – a sunny meadow, fence rows, sand dunes at the beach, a parking lot. 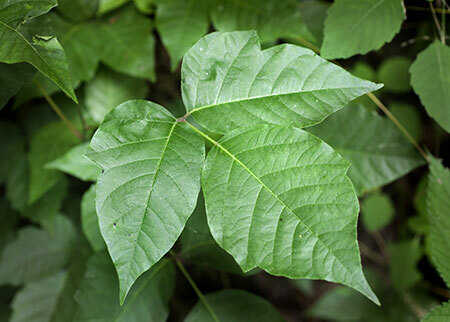 Poison ivy is most dangerous in spring and summer when oil content is the highest. Where I frequently weed, a native woodland habitat, it is hard to avoid encountering poison ivy. Thus, protective clothing is essential. I wear long pants, a long sleeve button-down shirt over a t-shirt, rubber boots or washable sneakers, tall socks, and gloves. Rubber gloves provide the best protection, but only if you are willing to toss them in the trash after one wearing. If I have an old pair, I will use them, especially if I intend to hand-pull the ivy. Otherwise, I wear one or two sets of latex gloves over my gardening gloves. 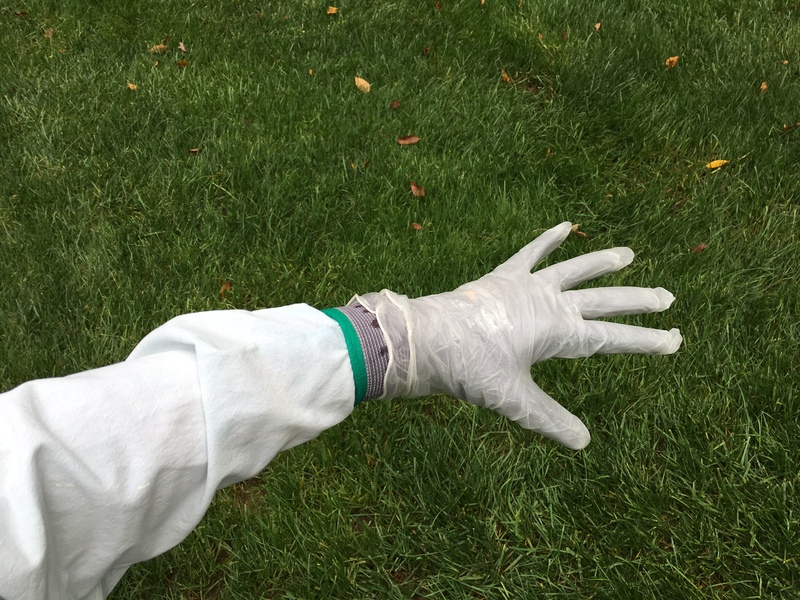 This way I can peel away and replace the outer layer (with a fresh set of disposable gloves) anytime I need to do something else with my hands, such as wipe sweat from my brow, pick up a gardening tool, or switch to another activity. Long plastic bags like the kind bread loaves come in are also effective to protect hands and arms, though harder to work in. Before I learned to be mindful of poison ivy’s presence while gardening, I would innocently transfer the toxic oil to my neck or face. Cleaning up properly after exposure is also important because the oil generally binds to the skin within 30 minutes and can remain active for months on objects like gardening tools and clothing. One is for the outer and inner layers of disposable gloves. Any small tools I have used get dropped into a second bag so they can be cleaned with rubbing alcohol later. Yet another bag is for my long-sleeve shirt because undoubtedly the sleeves have brushed against the ivy. As I remove the shirt, I pull the sleeves inside out to contain the exposed area. Once all sets of worn latex gloves are in a bag, and before I do anything else, that bag goes into the nearest trash can. My gardening gloves go into the bag with my shirt. Once indoors, I remove the rest of my clothing, being sure to also turn my pants inside out, so they are less apt to come in contact with a surface other than themselves. Launder everything including gardening gloves and sneakers in cold water and detergent. Do not use warm or hot water as it may spread the oil. Even if you have worn protective clothing, scrubbing your skin afterward with cold water and soap is recommended. There are special over-the-counter cleansing agents, such as Tecnu and Zanfel, to aid in the removal of urushiol from skin. There are protective lotions, too, (Ivy Shield and Ivy Block) that may reduce the risk of a poison-ivy rash by delaying the penetration of the oil. These are applied before exposure. Numerous topical ointments are available for treating poison ivy symptoms. If a rash develops despite your best preventative efforts, consult a physician or pharmacist for appropriate treatment. Poison ivy does have some redeeming qualities. It gives abundant food and shelter to wildlife which, by the way, are not negatively affected by urushiol. Deer and rabbit munch on its leaves. More than 55 bird species are known to consume poison ivy fruits. It is pollinated by bees; There is no urushiol in the nectar. A future article will explore methods to control poison ivy in the landscape.